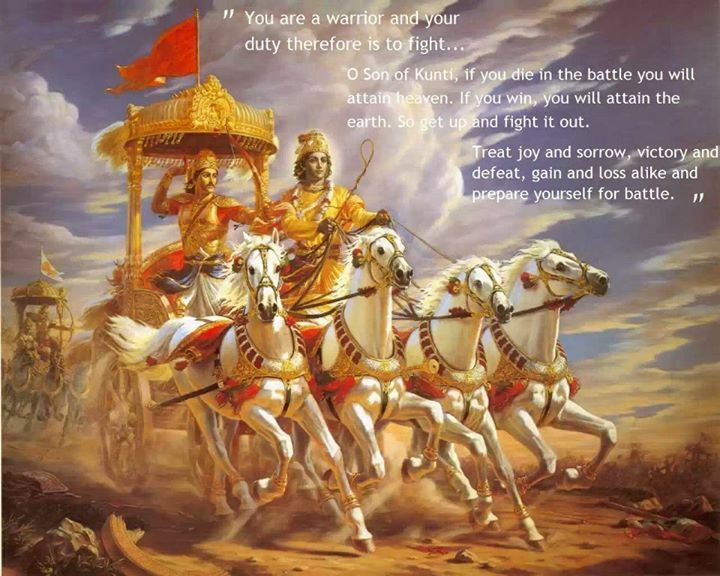 Lessons from Mahabharata: Will Lord Krishna return to destroy evil? Through the above Sanskrit Mantra, Lord Krishna has assured that whenever and wherever evil or adharma will threaten to take over good or dharma, he will manifest or arrive on earth to ensure that evil is destroyed. Although this is one of the most scared mantras, it is also making people ask this question again and again – Why hasn’t God arrived on earth considering the numerous ghastly evils taking place so regularly? I too have asked this innumerable times. However, I have stopped asking it in recent times. In fact, I have also started believing that it is futile to ask such a question. Before I explain the reason for this, I would like to clearly state that this is just my way of looking at an episode of Mahabharata and I don’t possess any concrete proof to support my theory. It is well-known that Lord Krishna helped Arjuna and other Pandava brothers to win the great war of Kurukshetra against the evil Kauravas. Looking at this incident, one would ask then why isn’t he helping the world right now to fight these many evils. But the analogy is not as simple as it appears. A deeper perception is required. Just before the start of the war, Arjuna straightaway refused to fight as he wasn’t ready to kill his own kinsmen, grandfather Bheeshma and his teacher Dronacharya. So Krishna encouraged him to fight through a long conversation, which later came to be known as the Bhagavad Gita. It is only after he agrees to fight that Krishna helps him by his various tactics. So if Krishna is God, why he didn’t use his powers to eliminate the Kauravas right at the start of the war? He had the power to end the war in a matter of seconds, so why didn’t he do that? Well, this incident gives a clear message that God helps us in our fight against any evil only if we are ready to fight against it with all our might. Until and unless we, in huge numbers, are determined to put in all our efforts in battling against various evils, God is not going to help us. We humans have enough power and strength to wage a war against adharma. By fearing and underestimating ourselves and overestimating the evil forces, we are falling prey to negativity. And where there is negativity, there is no God. History is full of examples of ordinary human beings fearlessly battling against oppressors. So it is not right to blame Him for not doing anything to alleviate if we are not willing to dedicate and ready ourselves for a mighty fight against evil forces. So, according to me, as a large majority of us (including me) aren’t doing anything to wipe out the corrupt and wicked forces, God isn’t using his powers to free us from various evils. Until and unless we don’t pull up our socks (mind you, in huge numbers) for the task, we shouldn’t expect God to perform any miracles. No doubt, there are a lot of people selflessly working for the upliftment of the downtrodden but the number isn’t enough. We can expect some miracle only if a large majority of us enter the battlefield of the various Kurukshetras of the world. Maybe the Lord is already present on earth just waiting for us to unanimously enter the battlefield.